This guide covers sources that are useful for researching Constitutional Law and Constitutional history. 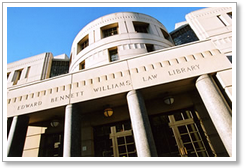 Go to: Browse > Topics > Constitutional Law and select a sub-topic. This tool on the library's website will direct you to key texts, study aids, and treatises on the topic of Constitutional Law. This guide covers sources on the judicial interpretation of the U.S. Constitution, historical sources for research into the creation of the U.S. and state constitutions, and provides a list of the leading treatises, reference sources, and law reviews on the Constitution and Constitutional Law. This article in Cornell LII's free online legal encyclopedia, Wex, provides a brief overview of basic constitutional law principles, including links to related federal and state statutes, state judicial decisions, conventions and treaties, and key internet sources. Covers constitutional law from Marbury v. Madison (1803) to the present. The objective of Constitutional Law in a Nutshell is to summarize the essence of the Court decisions and to do so in a concise and understandable way. Relied on by students, professors, and practitioners, Erwin Chemerinsky's popular treatise, Constitutional Law: Principles and Policies, Fifth Edition, clearly states the law and identifies the underlying policy issues in each area of constitutional law. An illustrated tongue-in-cheek look at the Constitution. Includes an examination of its history as early as the Magna Carta, going through its writing and ratification, as well as an analysis of how it has been used since ratification. Popularly known as the "Constitution Annotated," this free online source, prepared by the Congressional Research Service, contains historical notes and legal analysis and interpretation of the United States Constitution based primarily on Supreme Court case law. This six-volume work contains essays by leading constitutional scholars, law school professors, judges, historians, and political scientists on practical and theoretical topics dealing with every aspect of constitutional law in the U.S., from the Constitutional Convention in 1787 to the Clinton impeachment. This guide covers constitutional principles as well as an array of Supreme Court decisions on American society; includes updated entries on key cases over the past thirteen years, as well as a fully revised treatment of areas of constitutional law. Focusing on constitutional principles as interpreted by the Supreme Court, this source highlights over 2300 cases into approximately 1200 essays. Arranged alphabetically by topic, each essay highlights the constitutional background and the history of the issue. This encyclopedia contains 250 brief articles covering the most significant cases and Supreme Court justices. A listing on the library website of the leading treatises and study aids on American Legal History, including constitutional law. Chapter 2, Constitutional Law, provides detailed guidance on doing constitutional law research, especially for researching the history of the U.S. Constitution and for state constitutional law research. This website provides links to legislative history guides and sources for all 50 states. Supreme Court research guide describing the primary and secondary materials relating to the Supreme Court, both print and online, and their locations in the library. A guide by the Law Library of Congress. Includes links to texts/commentaries, historical texts, influences, judicial decisions, and additional guides.